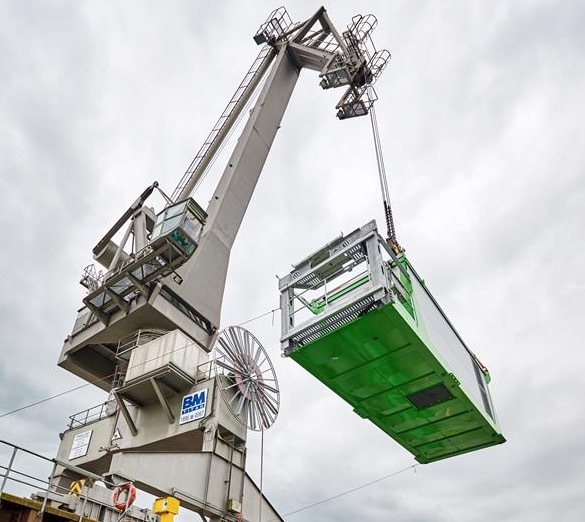 Burgas, Bulgaria – In a true logistics feat, the largest SENNEBOGEN balance material handler is now assembled and handling bulk goods every day at the Bulgaria’s largest Black Sea port. The 270,000 kilograms SENNEBOGEN 8400 EQ material handler leverages an innovative balance principle which, when combined with the machine’s electric drive, can save up to 75% in operating costs compared to traditional equipment of similar size. It has a reach of more than 39.9 m. (40 m) and is efficiently operated from a cab elevated to a height of about 20 m. (20 m). Equipped with a rail gantry undercarriage, the 8400 EQ easily moves up and down the Port of Burgas’ docking platform. Local trucks can simply drive under the material handler for fast loading. If only moving the massive machine to the Port of Burgas was as easy. The first 8400 EQ was initially assembled at the SENNEBOGEN plant in Straubing, Germany. In a tandem lifting operation, two cranes were used to place and then secure the uppercarriage and boom elements. Intensive factory testing followed, before the machine was dismantled into 36 individual parts for transport to Bulgaria. Using Europe’s second longest river, the Danube, the 36 parts of the first 8400 EQ would fit into the massive 1,200,000 kilograms river boat that travels regularly from Straubing toward Ruse, Bulgaria. Now on the job at the Port of Burgas, the SENNEBOGEN 8400 EQ is receiving positive reviews for its production and efficiency, including the fuel and energy savings resulting from the electric drive and balance principle. Incorporating the principle that the longer the lever is on one side, the greater the opposite counterweight must be, the 8400 EQ is able to retain perfect balance and put all energy into handling the load. Despite its massive size and unique design, the gantry-based balance material handler has proven easy for operators to maneuver thanks to the dual joysticks in the elevated cab.